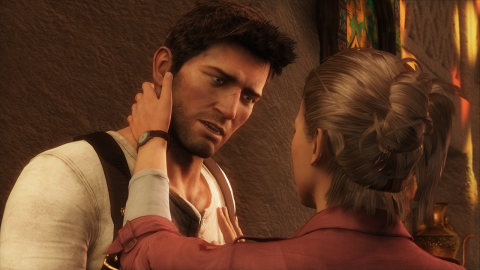 Can Nathan Drake's third adventure recapture Uncharted 2's magic? It can’t be easy being a console’s premier franchise; after Uncharted 2 knocked it out of the park two years ago, expectations for Nathan Drake’s next adventure have been running sky-high. For the most part, Uncharted 3: Drake’s Deception meets every last one of its fans’ lofty expectations, and does so with the series’ characteristic smirking panache. The action’s relentless and varied, with plenty of big cliffhanger set-pieces (many of which, if you’ve been following the game’s coverage so far, you may have already seen). The puzzles are big and ornate, and the environments – which range from dark London alleys and bright Yemeni markets to vast underground dungeons filled with ancient machinery and cool optical illusions – are beautifully detailed and filled with interesting things to see and do. As much as Uncharted 3 seems to get everything right, it still manages to fall short of its magnificent predecessor in a few important ways. We’ll get to those in a minute, though; first, there’s a lot to get excited for. After a brief detour through the Himalayas in the last game, Uncharted 3 puts Drake back on the trail of his famous ancestor, Sir Francis Drake. Without spoiling too much, it seems Sir Francis’ ring – the one Drake wears around his neck – is the key to finding the location of an ancient lost city, Iram of the Pillars, which lies hidden somewhere in the massive Rub’al Khali Desert. Naturally, Drake isn’t the only one who wants to find Iram, and his insistence on finding what his ancestor couldn’t (or wouldn’t) puts him on a collision course with one Katherine Marlowe, a brittle English matron who heads a secret society that’s been searching for Iram since the days of Queen Elizabeth I. What follows is a race to stay one step ahead of Marlowe as Drake, Sully, Chloe, Elena and a couple of new cohorts plow through London, Syria, France, Colombia, Yemen and – finally – the Rub’al Khali, getting into frequent fights with Marlowe’s shadowy British operatives along the way. There are a few big surprises, some hallucinogenic weirdness and a tiny bit of romance thrown in for good measure, but a big part of the focus here is on developing Drake’s character – specifically by exploring and explaining his relationship with his partner/mentor Sully, and by finally telling us a bit about just who Drake really is. Of course, character development doesn’t have a whole hell of a lot to do with the gameplay, which – like in the previous two games – tends to alternate between solving big environmental puzzles, scaling walls and/or jumping across platforms, and shooting squads of bad guys with the help of sticky cover (and two or three AI partners). More often than not, it’s a combination of those last two, and it’ll be familiar to anyone who’s played either of the previous games. There are, however, some interesting new additions this time around. It’s now possible, for example, to catch your enemies’ grenades and throw them back, provided you can hit a button within a specific timeframe (and yes, this ability carries over into multiplayer). New climbing portions have been added, in which you’ll have to take cover behind certain large handholds while taking vertical potshots at enemies above you. There’s also a bigger emphasis on stealth; it’s not mandatory or anything, but you’ll frequently see enemies walking around with flashlights, or standing around seemingly oblivious to your presence. When you do, staying out of sight and killing them silently will help you avoid hellish shitstorms of bullets, grenades and RPGs… at least for a little while. More significantly, the brawling system’s been tweaked a bit, with more frequent counters and grappling added to Drake’s previously straightforward punch combos. It feels a little more like Arkham Asylum/City than before, as your timing is now more important than your ability to mash the Square button. The system’s also context-sensitive, meaning you can do things like smash bottles across heads if you’re next to a bar, or finish your enemy by slamming his face into a nearby crate. With all this improved brawling, it’s not too surprising that there’d be a new enemy type to help make the most of it – and so we get the Brute, a hulking, unarmored foe who likes to stomp toward you and knock the gun right out of your hands. While they’re weirdly resistant to bullets, they’re fairly easy to take down with Drake’s fists, provided you can time all your counters and dodges right. Roll in a few notably unique action sequences – like a convoy-hopping chase through the desert on horseback, and an attempt to stay alive on a rapidly disintegrating plane – and more than a few of developer Naughty Dog’s signature run-toward-the-camera-while-death-races-in-behind-you sequences, and you’ve got the gist of what to expect. Finally, there’s the addition of 3D support, which – while not really adding a lot to the gameplay – does give the environments a clearer depth and weight, and makes the game just a little bit more immersive. It’s probably not going to sell you on 3D if you weren’t sold already, but if you’ve got a TV that supports it, playing Uncharted 3 with 3D on is a must. It’s all pretty fantastic – but is it as fantastic as Uncharted 2 was?